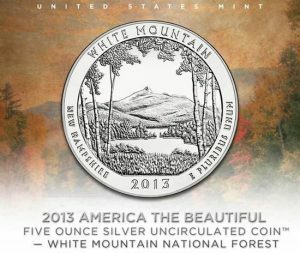 The United States Mint is now offering the collector 2013-P White Mountain National Forest Five Ounce Silver Uncirculated Coin. It is the first of its kind this year and the sixteenth overall in the series of numismatic America the Beautiful Five Ounce Silver Uncirculated Coins. This new product, bearing a reverse design representative of the national forest found in New Hampshire, has an opening price that is a little softer on consumer wallets. At $179.95, it’s a full $100 cheaper than when the series debuted with the first 2010-dated release. The very last issue, the sold out 2012 strike honoring Alaska’s Denali National Park, launched in November with pricing of $229.95. On Thursday, May 16, when the coins were released, the London silver Fix was $22.26 an ounce. That brings the melt value of the silver coin to $111.30 and its premium over melt to $68.65. United States Mint Sculptor-Engraver Phebe Hemphill designed and sculpted the reverse of the 2013-P White Mountain National Forest Five Ounce Silver Uncirculated Coin. It depicts Mt. Chocorua, the easternmost peak of the Sandwich Range, surrounded by common birch trees. Reverse inscriptions read WHITE MOUNTAIN, NEW HAMPSHIRE, 2013 and E PLURIBUS UNUM. Like all America the Beautiful coins, the obverse features John Flanagan’s well-known portrait of George Washington, the first President of the United States. The "P" mint mark indicates the coin’s origin from the United States Mint facility in Philadelphia, where all U.S. Mint issued five ounce coins originate. Obverse inscriptions include UNITED STATES OF AMERICA, LIBERTY, IN GOD WE TRUST and QUARTER DOLLAR. An edge inscription reads .999 FINE SILVER 5.0 OUNCE, the weight and fineness of the coin. Specifications of collectible America the Beautiful Five Ounce Silver Uncirculated Coins are nearly the same as the respective investor-quality bullion coins. Like the White Mountain bullion coin that launched a few days ago, each is composed of five ounces of 99.9% fine silver. The coin diameters stretch a full three inches and have a thickness of 0.165 inches. Difference between numismatic uncirculated coins and bullion coins include the "P" mint mark found on the obverse of the numismatic version, which is missing on the investor strike, and the way the two versions are distributed. Investment renditions are sold via the U.S. Mint’s limited network of authorized silver purchasers for a small premium above the current spot price of the precious metal they contain. The uncirculated coins are sold directly to the public by the U.S. Mint at a steady, published price. 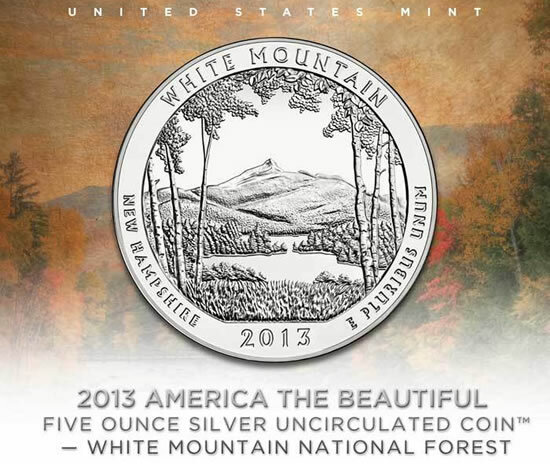 A maximum mintage of 25,000 will apply to the White Mountain Silver Uncirculated Coin. Last year’s issues did not reach their intended mintages as the U.S. Mint produced fewer based on early collector demand. Reduced pricing may help spark sales this year. For comparison purposes, final sales totals for past issues are illustrated in a chart at the bottom of this article. The new White Mountain silver coin may be purchased from the U.S. Mint either through its website, found here, or by phone toll-free at 1-800-USA-MINT (872-6468). There are no household ordering limits for this release. Each numismatic White Mountain National Forest Five Ounce Silver Uncirculated Coin is encapsulated for protection and placed inside an outer box. It ships with a Certificate of Authenticity. Below is the list of 2011- and 2012-dated ATB Silver Uncirculated Coins and their last reported sales figures before they sold out or went off sale. As reflected above, the U.S. Mint has released five America the Beautiful coin designs annually. Each new release honors a different national park or site of interest. By the time the program ends in 2021, one site per state and U.S. territory will have been featured. The artwork is the same as the corresponding America the Beautiful Quarters® produced for public commerce. I just placed my order for all 25,000 of them. I like them a lot. Thanks Rhonda. That premium over melt value seems a little steep, no ? I like how the pic has the P mintmark whereas the five-ounce version, according to the article, will have no such P. I think the copy is hilarious, trumpeting how much cheaper this coin is versus previous releases without mentioning silver’s more recent performance. I also find the premium (price over spot) to be offputting. @wonkwonk, did you read the same article as me? It doesn’t seem like it. The mint mark on the coin is obvious starting with the first sentence, and the article states how they are on the numismatic coins and not the bullion coins. In terms of trumpeting a cheaper price, I haven’t seen other sites actually list the premium for this coin over its melt value. I suppose the article could have linked to a past one talking about when prices were lowered http://www.coinnews.net/2013/05/01/us-mint-to-cut-2013-silver-eagle-and-5-oz-silver-coin-prices/. Once again it seems we have bullion collectors tabulating the premium over melt on a mint issued collectors coin and complaining. The is an obvious solution to your problem with this coin – buy the bullion coins and you’ll be fine. It is highly unlikely the person who buys this coin with the P mint mark, will be doing so with the idea they’ll sell it at melt prices in the future. I bought 2 of these – the mint issue at $179.95 and the bullion coin at $142. I wish bullion collectors would stop reading these stories. wonk – you must have speed read the article – and totally missed most of it. I have 600 million. I just bot the lotto ticket at Publix. So how should i spend it? Looking for some input here! I don’t think there is a “White Mountain” in NH – people refer to the White MountainS plural – in Vermont it is the Green Mountains. Yes people say White Mountain National Forest, but I’ve never heard anyone refer to a ‘White mountain’. I think this is a mistake of sorts. we used to take a trip to the White Mountains when I was a kid, not the White Mountain.